An unreleased surveillance video from the Boston Marathon attack shows Dzhokhar Tsarnaev dropping his backpack and calmly walking away from it before the bomb inside it exploded, Massachusetts Governor Deval Patrick said Sunday. The video clearly puts 19-year-old Dzhokhar Tsarnaev at the scene of the attack, the governor said on NBC. “It does seem to be pretty clear that this suspect took the backpack off, put it down, did not react when the first explosion went off and then moved away from the backpack in time for the second explosion,” Deval Patrick said. The governor added, however, that he hasn’t viewed all the tapes but had been briefed by law enforcement about them. 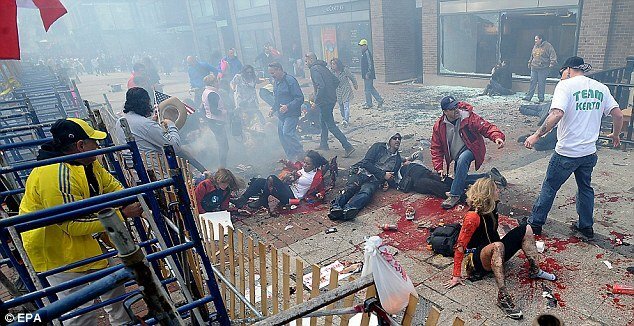 Investigators have determined the bombs were fashioned from pressure cookers packed with explosives, nails and ball bearings and hidden in black backpacks. Three people were killed and more than 180 injured when the two bombs exploded Monday at the finish line of the Boston Marathon about four hours into the race. Dzhokhar Tsarnaev was captured Friday after being pulled bloody and wounded from David Henneberry’s backyard boat in Watertown. The suspect is being guarded by armed officers while he recovers at a Boston hospital. Dzhokhar Tsarnaev is in serious condition but now he is conscious and able to communicate with investigators in writing. His 26-year-old brother and alleged accomplice, Tamerlan Tsarnaev, died earlier Friday after a gunbattle with police in Watertown. Dzhokhar and Tamerlan Tsarnaev are also suspected of killing an MIT police officer Thursday and severely injuring a transit officer.